Not to be confused with Audacious (software). 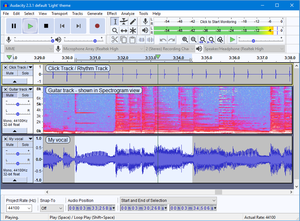 Audacity is a free and open-source digital audio editor and recording application software, available for Windows, macOS/OS X and Unix-like operating systems. Audacity was started in the fall of 1999 by Dominic Mazzoni and Roger Dannenberg at Carnegie Mellon University and was released on May 28, 2000 as version 0.8. As of October 10, 2011, it was the 11th most popular download from SourceForge, with 76.5 million downloads. Audacity won the SourceForge 2007 and 2009 Community Choice Award for Best Project for Multimedia. In March 2015 hosting was moved to FossHub and by March, 2019 it had exceeded 70.6 million downloads there. Audacity's main panel annotated. All the components that have been labelled are custom for Audacity. Timer Record  enables the user to schedule when a recording begins and ends to make an unattended recording. Importing and exporting of WAV, AIFF, MP3 (via the LAME encoder, downloaded separately), Ogg Vorbis, and all file formats supported by libsndfile library. Versions 1.3.2 and later supported Free Lossless Audio Codec (FLAC). Version 1.3.6 and later also supported additional formats such as WMA, AAC, AMR and AC3 via the optional FFmpeg library. Audacity supports only 32-bit or 64-bit VST audio effect plug-ins, depending on which architecture it was built for, but not both at the same time. It does not support instrument VST (VSTi) plugins. Audacity lacks dynamic equalizer controls and real time effects while recording. Audacity does not natively import or export WMA, AAC, AC3 or most other proprietary or restricted file formats; rather, an optional FFmpeg library is required. In addition to English language, the Graphical User Interface of the Audacity software program is translated into Afrikaans, Arabic, Basque, Bulgarian, Catalan, Chinese (simplified), Chinese (traditional), Czech, Danish, Dutch, Finnish, French, Galician, German, Greek, Hungarian, Irish, Italian, Japanese, Lithuanian, Macedonian, Norwegian (Bokmål), Polish, Portuguese, Romanian, Russian, Slovak, Slovenian, Spanish, Swedish, Turkish, Ukrainian, and Welsh. The documentation, the Audacity Manual, is available only in English. The Audacity Forum offers technical support in: Spanish, French, Russian and German. The diagram illustrates the layers and modules in Audacity. Note the three important classes within wxWidgets, each of which has a reflection in Audacity. Higher-level abstractions result from related lower-level ones. For example, the BlockFile system is a reflection of and is built on wxWidgets' wxFiles. Lower down in the diagram is a narrow strip for "Platform Specific Implementation Layers." Both wxWidgets and PortAudio are OS abstraction layers. Both contain conditional code that chooses between different implementations depending on the target platform. The free and open nature of Audacity has allowed it to become very popular in education, encouraging its developers to make the user interface easier for students and teachers. CNET rated Audacity 5/5 stars and called it "feature rich and flexible". Preston Gralla of PC World said, "If you're interested in creating, editing, and mixing you'll want Audacity." Jack Wallen of Tech Republic highlighted its features and ease-of-use. Michael Muchmore of PC Magazine rated it 3.5/5 stars and said, "Though not as slick or powerful as programs from the likes of Adobe, Sony, and M-Audio, Audacity is surprisingly feature-full for free software." In The Art of Unix Programming, Eric S. Raymond says of Audacity "The central virtue of this program is that it has a superbly transparent and natural user interface, one that erects as few barriers between the user and the sound file as possible." Several authors criticized Audacity for inconvenient user interface, destructive editing and lack of features, comparing Audacity unfavorably to competing products, which require fewer actions from the user to do tasks such as crossfade and noise reduction. Latest compatible Audacity version, by platform. James Crook, Amy Brown, Greg Wilson - The Architecture of Open Source Applications - Chapter 2 Audacity, released 2012 under CC BY 3.0 (Open access). ^ "Release Notes 2.3.1". Audacity Wiki. 2019-03-08. Retrieved 2019-03-08. ^ SourceForge (July 2004). "Project of the Month July 2004 - Audacity". Archived from the original on 23 December 2008. Retrieved 2008-11-27. ^ United Nations Conference on Trade and Development (2004). "E-Commerce and Development Report 2004" (PDF). Archived (PDF) from the original on 3 December 2008. Retrieved 2008-11-27. ^ a b "Audacity: Free Audio Editor and Recorder". audacityteam.org. Retrieved 5 January 2012. ^ a b "About Audacity". audacityteam.org. Retrieved 2012-02-19. ^ Audacity Team. "Copyright". Retrieved 2018-10-03. ^ "Credits". audacityteam.org. Retrieved 2012-02-19. ^ "SourceForge.net: 2007 Community Choice Awards". Archived from the original on 20 January 2008. Retrieved 2008-01-19. ^ "SourceForge.net: 2009 Community Choice Awards". Retrieved 2012-02-04. ^ a b c d James Crook (March 15, 2012). "Chapter 2. Audacity". The Architecture of Open Source Applications. Amy Brown, Greg Wilson. ISBN 978-1257638017. ^ "Podcasting with Linux Command Line Tools and Audacity". Archived from the original on 18 January 2008. Retrieved 2008-01-19. ^ Frere-Jones, Sasha (May 2, 2011). "World of Wonder: How Merrill Garbus left the theatre and took the stage." The New Yorker. Retrieved 2015-05-16. ^ "Playing and Recording". Audacityteam.org. ^ "Scrubbing and Seeking". Audacityteam.org. Archived from the original on 2016-03-08. ^ "Edit commands in Audacity". Audacityteam.org. ^ "Audacity's Envelope Tool". Audacityteam.org. ^ "Copying tapes, LPs or MiniDiscs to CD". Audacityteam.org. ^ "Cross-platform downloads for Audacity". Audacityteam.org. ^ "wxWidgets Cross-platform GUI Library". Audacityteam.org. ^ "Index of Effects, Generators and Analyzers in Audacity". Audacityteam.org. ^ "Nyquist Plug-ins Reference". Audacityteam.org. ^ Audacity development team . "Audacity: Plug-ins and Libraries". ^ "Vocal Reduction and Isolation". Audacityteam.org. ^ "Real-time preview of effects". Audacityteam.org. ^ "Manage Effects, Generators and Analyzers". Audacityteam.org. ^ "Audacity Tracks Menu". Audacityteam.org. Archived from the original on 2016-03-04. ^ "Audacity's Spectrogram View". Audacityteam.org. ^ Audacity development team (2006-10-30). "Audacity 1.3.2 a 1.2.5 released". Retrieved 2010-01-19. ^ "Calf Studio Gear supports LV2". ^ "FAQ:How do I install VST plug-ins? - Audacity Manual". Audacityteam.org. Retrieved 2013-08-09. ^ "Audacity: Features". audacityteam.org. 2013-03-22. Retrieved 2013-09-08. ^ "Languages - Audacity Development Manual". manual.audacityteam.org. Retrieved 29 September 2018. ^ "Audacity Development Manual". manual.audacityteam.org. Retrieved 29 September 2018. ^ Jaworski, Nick; Thibeault, Matthew D. (2011). "Technology for Teaching: Audacity. Free and open-source software". Music Educators Journal. 98 (2): 39–40. doi:10.1177/0027432111428745. ISSN 0027-4321. ^ "Audacity". CNET. 2008-11-08. Retrieved 2013-09-01. ^ Gralla, Preston (2008-10-22). "Audacity". PC World. Retrieved 2013-09-01. ^ Wallen, Jack (2011-07-18). "Giving Audacity its due: An audio editor with serious functionality". Tech Republic. Retrieved 2013-09-01. ^ Muchmore, Michael (2010-02-05). "Audacity 1.2 review". Retrieved 2013-09-01. ^ "Studying Cases Chapter 6. Transparency". ^ Lewis, Daniel (2012-12-03). "7 reasons I'm switching from Audacity to Audition (and why you shouldn't)". Retrieved 2018-02-15. ^ McLean, Matthew (2017-06-01). "Audacity Vs Adobe Audition CC | Where Should I Record & Edit My Podcast?". Retrieved 2018-02-15. Franklin, Jerry (2006). "The Sheer Audacity: How to Get More, in Less Time, from the Audacity Digital Audio Editing Software". 2006 IEEE International Professional Communication Conference. pp. 92–105. doi:10.1109/IPCC.2006.320394. ISBN 978-0-7803-9778-1. Mazzoni, Dominic; Dannenberg, Roger B. (2002). "A Fast Data Structure for Disk-Based Audio Editing". Computer Music Journal. 26 (2): 62–76. CiteSeerX 10.1.1.72.7855. doi:10.1162/014892602760137185. ISSN 0148-9267. Bernardini, Nicola; Rocchesso, Davide (2002). "Making Sounds with Numbers: A Tutorial on Music Software Dedicated to Digital Audio". Journal of New Music Research. 31 (2): 141–151. CiteSeerX 10.1.1.41.1211. doi:10.1076/jnmr.31.2.141.8089. ISSN 0929-8215. This page was last edited on 13 March 2019, at 15:55 (UTC).